Infinitus is a critically acclaimed beatboxing string trio known for their unique sound and upbeat performance style. Their repertoire features classical standards and original jazz/hip-hop arrangements and compositions. 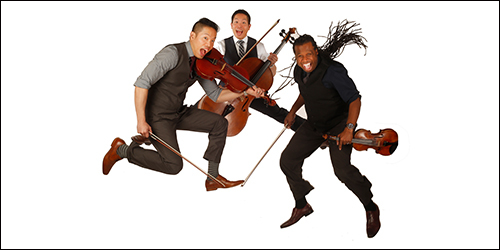 Formed in 2008 by violist Anthony Cheung, cellist Alex Cheung, and violinist John “Adidam” Littlejohn, Infinitus is quickly becoming one of North America’s premier chamber groups. Collectively, the members hold degrees from the University of Michigan and the Peabody Conservatory and have won local, national, and international awards. Infinitus has been featured on CBC, National Public Radio, OMNI Television and in numerous publications. They have released two albums, Infinitus and Christmas Fantasia, and have performed at some of the world’s best venues, including a six-performance Lincoln Center Residency in New York City. Currently based in Vancouver, British Columbia, Infinitus performs regularly as part of the Vancouver Chamber Players Concert Series and is on the faculty of the Thrive City String Boot Camp, the Saint James Music Academy, and the Vancouver Academy of Music. Come early to enjoy performances by local organizations, including second-graders from Christ Methodist Church, and create your own instrument out of recyclable materials! Pre-show activities start at 9am. After the performance, get up close and personal with real instruments in our instrument petting zoo. The Chomp food truck will also be selling treats from 9am to 12:30pm.